Thank you so much for the donations! Over $3500 came in in donations from $1 to $500 (!!!). There was a problem with the Amazon Honor System. Some people got through and others didn't. After much effort, I found out what the problem is. Amazon arbitrarily imposes a limit of how much money you can receive per month. It is $500 and thanks to your generosity, we hit that limit. I am trying to get it raised. With PayPal I am a verified business member so there is no limit. I told Amazon they could give a lot better error message than they do. Anyway, if you would still like to make a donation, either use PayPal or wait until this is fixed. I removed the Amazon icon for the moment. Sorry for the inconvenience. With the olympics dominating everyone's attention now, advertising this week is not a good use of money. I will start advertising at the start of the Republican National Convention. That will give a bigger bang for the buck. There were so many donations that I can't thank everyone personally, but one BIG collective thank you to everyone. Today we have lots of polls to report, including Florida and Ohio. Survey USA puts Kerry ahead 47% to 46% there with Nader at 2%. He is also a hair ahead in Ohio at 48% to 46% according to the University of Cincinnati, a new entrant into the polling sweepstakes. Both states are still statistically tied of course. A very strange Survey USA poll puts Bush within 3% of Kerry in California, 49% to 46%. I don't believe that for a second. Remember that polls are always reported with a margin of error (MoE). For state polls, it is nearly always 3.5% to 4%, so we don't report it. What this means is that if you repeat the poll over and over, 95% of the time the difference between the true (unknown) mean and the measured mean will be no more than the MoE. A consequence of this is that 5% of the time, the measured mean will be off by more than the MoE. I don't know if this is the case here, but the data are very suspect. There is no reason to think Survey USA is cheating here. This may just be a statistical outlier. Kerry is maintaining his small (3%) lead in Minnesota. The tightness of the race there is a welcome surprise to Bush. He probably won't win it, but he can force Kerry to spend time and money on what should have been an easy win. 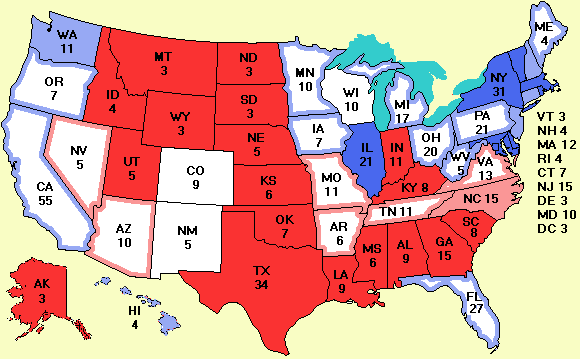 The reverse holds for Virginia and Arkansas though, and maybe Colorado, but I'd like to see a few more polls before I take that too seriously. One poll does not an election make, or something like that. Especially not in August.